Are you are a car owner that has an irreparably damaged car that cannot be driven anymore? Do you live in Perth? Congratulations! You have a way to get rid of it and make some money as well. This is thanks to us here at Perth Auto Wreckers. We will come over and take your car off your hands via our free car removal Perth service. But not until after we pay you maximum dollars into your bank account. This service is available in all of Perth, WA and the surrounding Perth region. Our giant fleet of tow trucks has been always ready to remove a wide variety of vehicles. Whether you are selling a car, truck, van, Ute, SUV or 4×4, we are the ones who will do it for you with no fuss! The amount of car removal companies in the industry isn’t small. However, if you decide at random to sell to any one of them, you may just find that they will not remove your car for free. Instead, they will ask you to provide transport for the vehicle in question yourself. Or they will hide the cost of removal by paying less for your vehicle than it is worth to them. Here at Perth Auto Wreckers, we do things decidedly differently. We pay cash for cars without making hassles. We want our customers to get the maximum amount of dollars that is possible for them to get. Making them pay for the removal of their vehicle will only counteract this desire. So instead, we come over with our removal equipment, and we provide the removal service free of charge! The amount of money that we will pay into your bank account for your automobile will depend on the make, model, age and condition of the car. It can be as much as $9’999. We are Licensed Company and Registered Car Removal Business. The amount of reasons why you should choose us for all your car removal needs may be plenty. But it is quality, and not quantity, that we are concerned with here. One great reason is the fact that we buy all kinds of vehicle. You don’t have to worry about whether your automobile will be accepted if it is a truck, car, Ute, 4×4 or SUV. We accept vehicles no matter what the level of disrepair on them is like as well. We will provide our removal service to you if your car is on your property, or broken down on the motorway somewhere. Our team members do all the paperwork that needs to be done, and then we take it off into the sunset and back to our salvage yard. If you would like to learn how much money your car could make when selling to us, it is easy to find out. You can either drop us a line via the phone, or alternatively you are invited to visit our website and locate the quote request form on the main page. How Does Our Car Removal Process Work? Here at Perth Auto Wreckers, we are proud to make the most unbeatable offer for your vehicle. We also take it upon ourselves to pick your car up after we buy it. Contact us for the free price quote, either online or via phone, and tell us all about your vehicle. We come over, inspect the car and make a final offer. We pay you and remove the car from your property. You can even contact us if you want car shell removal after removing parts yourself. The car’s make and model. How old it is, and what condition it is in. Whether it is registered or not. Whether it is road worthy or broken down. We cover the entire Western Australia and offer a free vehicle removal service, but our daily runs include Maddington, Perth, Rockingham, Armadale, Belmont, Thornlie, Kwinana and Cockburn. Ford, Audi, Jeep, Peugeot, Saab, Daewoo, Renault, Mercedes Benz, BMW, Toyota, Nissan, Suzuki, Honda, Mitsubishi, Subaru, Hyundai, Skoda, Volkswagen, and many more on top of that! If your vehicle has been the victim of severe water damage due to flooding in your area, have no fear. The fact that it is irreparable will not disqualify it from us wanting to buy it off you. Instead, our cash for cars Perth crew will gladly pay you for it. We will be able to find car parts and materials on it that are salvageable, no doubt. If your automobile has suffered terrible damage in an accident and all the parts are destroyed, we will still be able to sell the steel and other materials. In short, there is no level of disrepair that your car can possibly be in that will make us not want to buy it. The reason is we are an auto recycling company, so we buy junk, scrap, unwanted, totalled, water or fire damaged, rusty, broken, accidental, unregistered cars all the time anyway. So whether your vehicle has been in a crash, or it is simply a used car that you don’t want anymore, sell it to us and get top dollar! It is easy and simple to contact us. You can either call us at 08 9452 8859 or you can go to our website and fill out the form on the main page. Whatever you decide to do, you can be sure you have chosen the right people to sell your car to. So don’t put up with that broken down vehicle living in your lawn rent free any longer. 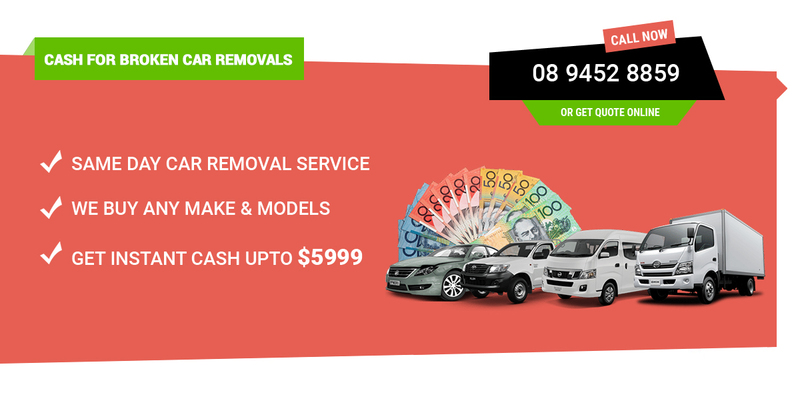 Get in touch with our car removal Perth, WA crew and get maximum dollars for it, along with free removal. You will be glad you did!